In this world appearance is everything. The way you look, what you wear, the people you know, how successful you are, how healthy you are, what school you went to, how well your kids are doing in school or athletics. The list goes on. We live in a society that bases your worth on performance. We judge ourselves and measure our success according to what society says is success. If we ‘measure up’ then there is a sense of pride because we think we are better than other people who don’t ‘measure up.’ If we ‘don’t measure up’ then there is a sense of unworthiness or shame. Both of these are destructive. Why am I talking about this? Because this week God has rocked my world and showed me an ugly side that I didn’t like seeing. My pride. This past week I have been in the rut of comparison, especially as it relates to my blog. I compare myself to other people, sometimes to more successful people (which then makes me feel unworthy) so I switch to less successful to make myself feel better. I drop names of people that I know or am friends with who I know are “more successful” as a way to puff myself up. I talk about my own success or fluff things to make them seem bigger than they are. If I don’t feel like I measure up I try harder, spend more time diving into work, become obsessed with success, and push everything else out of the way. Even as I write this I’m sick to my stomach, it’s scary to lay the ugly stuff down on the internet… but so easy to lay the happy stuff. We all want to “look good” in front of other people … PRIDE … but let’s lay that down and be real! Take the mask off and talk about the things worth talking about! It’s so easy to compare. To look at other peoples lives and say, “oh I’m doing better than that” ahem.. pride … or “wow they really have it all together, I need to pick it up.” Ahem… performance! It’s exhausting, never ending, and honestly pretty ugly behavior. As I was praying about it and asking the Lord what he had to say about my pride I heard the words. Live your identity. My identity first and foremost is “beloved daughter,” that is what he calls me. I find peace in that. No striving. No success or failure because God told me what I am, a daughter of his. No comparison, just being. There is Freedom. Beauty. Joy. Peace. Rest. That is how I want to live. Thanks for listening. Just some thoughts I had throughout the week that I wanted to share with you. I hope it challenges and encourages you at the same time. One of my favorite squashes to have in the fall is definitely butternut squash. It is sweet, creamy, and slightly nutty. Which is why it is the perfect vehicle for a creamy Alfredo type sauce, I don’t know why I didn’t think of this until just now! 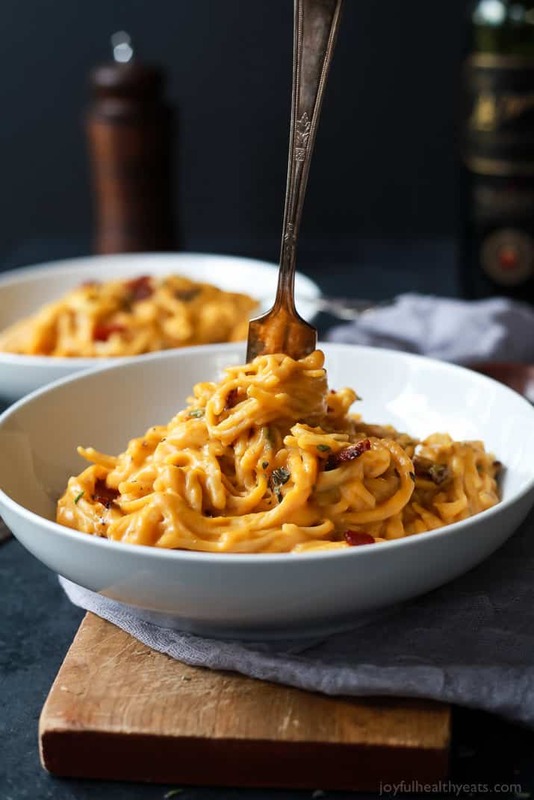 This Butternut Squash Alfredo Pasta has fresh sage and thyme permeated throughout the sauce and is made even creamier with a touch of milk then blended together until it is silky smooth. 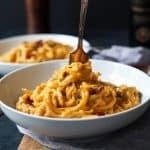 To cut through some of the sweetness of the squash I finished this dish with a bit of crunchy bacon on top, the sweet salty combo and luscious flavors of this pasta will seriously leave you wanting more after every bite. It is the perfect recipe to devour this fall. The best part is it takes only 30 minutes to make and is gluten free. I cannot wait to hear what you think of this pasta recipe! Bon Appetite my friends! In a large skillet add the butter and red onion. Saute until slightly soft, about 1-2 minutes. Next add in the garlic, saute for 30 seconds, stir and add the butternut squash, chicken stock, sage, and thyme. Stir and cover. Cook until the butternut squash is fork tender, about 8-10 minutes. When the squash is tender, add the squash to a food processor along with the milk and salt to taste. Puree until smooth. In the meantime heat a small skillet to medium high heat, add the diced bacon to the pan and saute until the bacon is crispy. About 4-5 minutes. When the bacon is done, place it on a paper towel lined plate to let the grease drain. Bring a large pot of water to a boil. Add gluten free pasta, cook according to directions, (6-8 minutes) do not overcook. 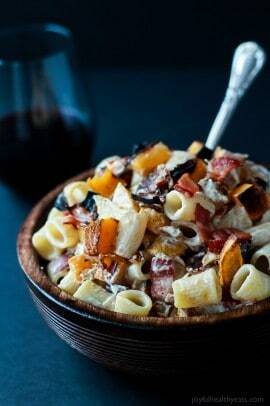 Drain pasta and add butternut squash sauce to the pasta, gently toss together and top with crispy bacon. Serve! 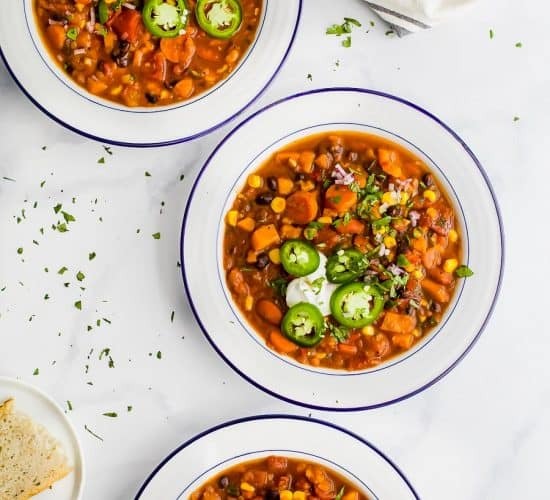 Want More Winter Squash Recipes? Oh my goodness this looks amazing! What a fun way to use butternut squash! This sounds right up my alley! I don’t know why I never thought of making a sauce with butternut squash, either – just seems like a natural! Pinning this, too! are you just baking the squash and then cutting it into cubes? I want to give this a try but wondering can i make this ahead (1-2 days)? Would this freeze well? You could make the sauce ahead of time, but I wouldn’t make the noodles. It will freeze fine, just make sure to let is thaw in the fridge overnight before use. I’m planning on making this tonight. Looks delicious! Do you think if I make the sauce now and put in the fridge for a couple hours the sauce will stay just as good? Thanks! oh absolutely the sauce will be fine! This is absolutely brilliant! We love butternut squash here too, and I just made a red chile enchilada sauce with it! 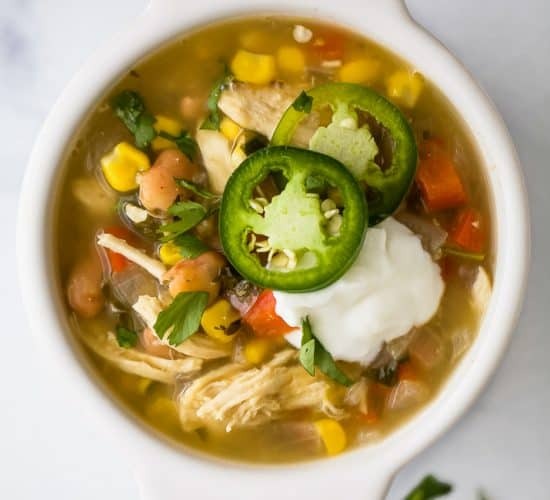 I’m always looking for other ways to use it besides soup, so I am thrilled to find your recipe! Hurray and that enchilada sauce sounds amazing! Can’t wait to hear what you think of this pasta! 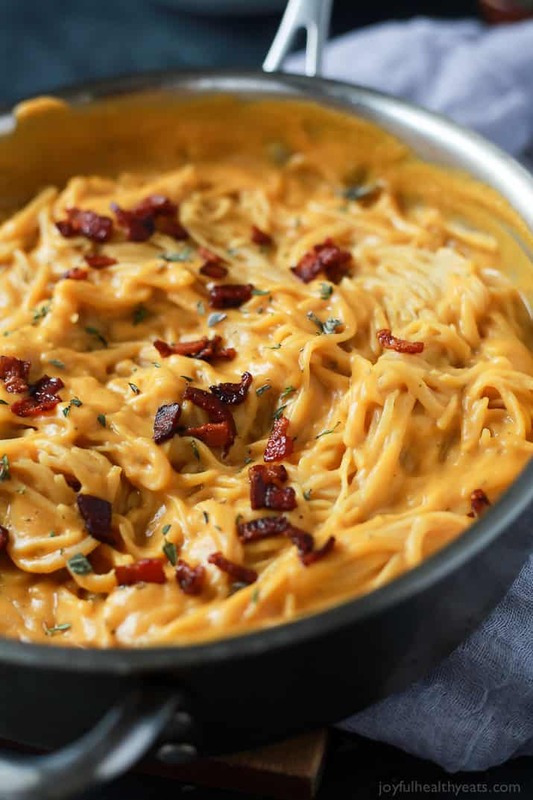 The sauce on this pasta looks so creamy and delicious! 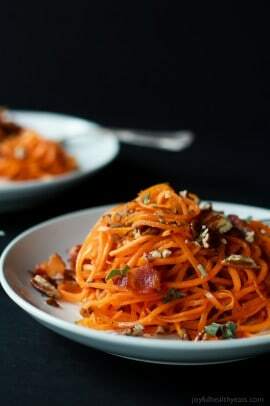 Butternut squash is so versatile! I can’t tell you enough how delicious this dish looks. The bacon topping is just the perfect way to round out all those flavors. right! The bacon totally takes this over the top! Great minds think alike! Either way this pasta is freakin delicious! You will absolutely be in love! Hi, I am visiting your site through Pinterest. I don’t have a blogging account so I don’t know how to properly comment but i just wanted to say thank you for posting this. What you said in the beginning about living in a world that measures your worth by your performance. That really hit home. I found peace in what you said about being his “beloved daughter”. Just wanted to let you know that I needed to hear this. Thank you!! I got goosebumps reading this Laney. Thank you so much for stopping in to comment! It means the world and seriously so encouraging to hear that I am encouraging someone else by sharing what’s on my heart! You made my day! Oh my goodness, this looks and sounds incredible! 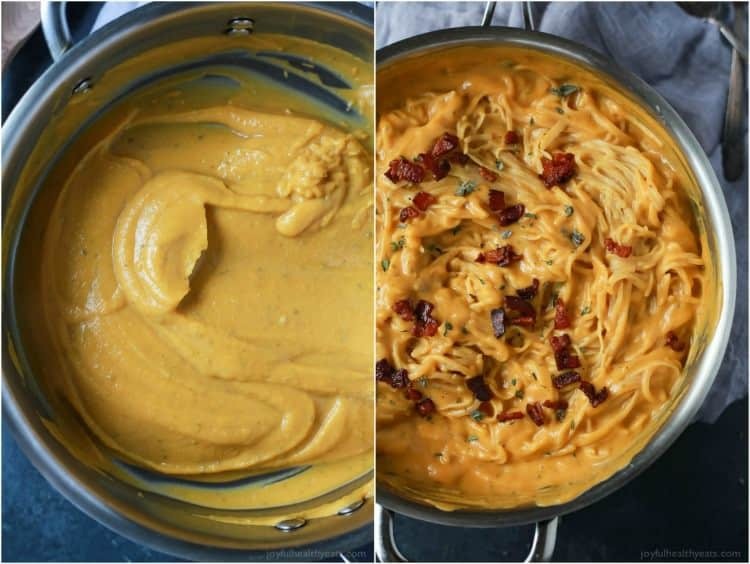 LOVE that creamy butternut squash sauce, sooooo delicious! oh girl it is! thank you so much Kimberly! I can’t tell you how much I love this dish! You’ve combined so many of my favorites here and the result looks fabulous. Pinned! Thank you so much Valerie so pumped to hear that. Can’t wait to hear what you think! First of all, this pasta looks amazing! 🙂 So creamy & love the flavors! Second of all, I know all too well what you are talking about with the comparison & envy, especially when it comes to blogging. I am guilty of that as well from time to time :/ It is part of being human, but I hate the way that it makes me feel when I stoop to that. Thanks Carrie, pumped you liked the recipe too! Butternut squash, alfredo and pasta all in the same sentence?! Girl you are speaking my language here. I think I’ve died and gone to heaven. woohoo!! So glad to hear it Whit! 🙂 Thanks for coming back and letting me know, I appreciate it! What a simply dreamy dish! I love a big bowl of creamy pasta, especially with fall veggies like this. Pass me two bowls, please! Thanks Steph, it is definitely dreamy with the creamy butternut squash… sooo good! I do not have a food processor. 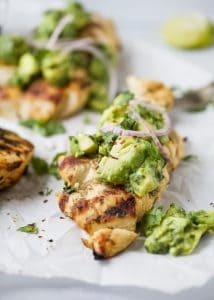 Are you able to use a blender instead for that part of the recipe? How about a masher to mash it with? 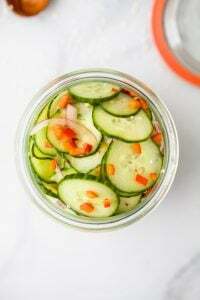 Currently back packing around NZ and have no access to anything electrical, but would love to try this recipie as it looks delicious, and uses veggies that are in season! Hmm… you could definitely try a masher. It will have a thicker consistency but still be good Jean! haha… I like the extra bacon idea! So glad you and the fam liked this! We gobbled it up too, so creamy and delicious! This looked great, but very disappointing! I don’t have time to waste posting comments, but wanted to let other busy mothers not to waste their time on this recipe! My 4 year old wouldn’t touch it. Oh bummer, I’m sad your 4 year old didn’t like it, my 3 year old loved it! Especially the bacon. 🙂 I guess to each his/her own. I do think that other busy mothers might have a better experience with this with their children and you seemed to with your 4 year old. It seems a bit unfair to suggest that every other child in the world might react as yours did? Just thinking that one should give something a try once and then maybe think that it just did not work for you but it might work for others…Perhaps your 4 year old is just not into squash yet. 🙂 Others have commented on how much their kids did enjoy it. Taste preferences are very subjective. My 4 year old granddaughter loved this. My 6 year old granddaughter did not. She had peanut butter and jelly for dinner while the rest of us had pasta. My girls always loved squash and sweet potatoes, but other kids didn’t, so I guess it depends on the child and their dislikes. Out of 6 people, 5 of us liked it a lot, so I think that’s a pretty good percentage. I, incidentally, liked it very much, as did my celiac daughter who is somewhat limited by her dietary requirements. So, thanks for the recipe, and always remember, you are His beloved daughter, first and mostly importantly. This looks heavenly. Going to make it this week for dinner. Woohoo! You’ll love it Amanda! I made it tonight and it was very good, I was surprised that I didn’t mess it up! Woohoo! Way to go, so glad you liked it Maria! This was SO DELICIOUS I could kiss you! Ever since having to give up dairy for health reasons Ive tried way too many “alfredo” recipes only to be left completely disappointed. I only tried this recipe because I have excess squash and figured why not. I used oil instead of butter and coconut milk (the creamy kind that comes from the can) instead of regular milk and it was DELICIOUS! Of course its not a full fat cream and butter alfredo but its close enough for me! The flavor is wonderful and the texture was perfect. I could easily eat this every day of the week! Thank you!! LOVE the coconut cream addition, it probably enhanced the natural sweetness of the squash. I need to try that! So glad you liked it Kim, it really is one of our favorites and my son chowed this pasta down! Oh I’m so glad to see someone tried this with coconut milk and had great results! I recently went Paleo so no dairy for me. Thanks for posting! Oh yes, coconut milk would be great in this! You’ll love it Karen! This is very good!! Can you freeze the sauce? Thank you so much Kayla. Honestly, I’m not sure, I haven’t done it before. But with the milk I’d be careful with freezing and then thawing. Do you think you could make this the day before and reheat or round it separate and get oily like regular alfredo? Ohhh… interesting! So glad it turned out even with the different squash! Sounds yummy! Love the changes you made to make it your own Tara! Just wondering… After u sautée the quash with the herbs and ck stock do u add all of that to the blender or just pick out the squash? Add it all to the blender and puree it all. 🙂 Then be ready for deliciousness! Did you decrease the amount of thyme since it was dry? Typically dry spices are much stronger so if you used the same quantity it would have been a very strong taste. But in either case you could definitely leave it out if it’s not your thing. 🙂 Better luck next time Bonnie! Thanks for stopping in and sharing! What are butternut squash cubes? I bought butternut squash – do i just cube it raw? Or cook it first then cube it? What is awesome about this recipe is that one can use this in more ways than this. I can slurp this just like soup. 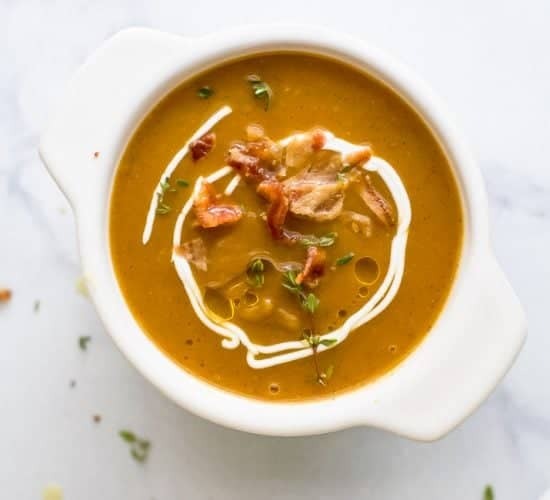 A thick rich creamy soup. I chose to make this in the slow cooker though as we are still not into our new kitchen. It takes longer doing it this way, but seems it is going to be just as tasty. Haven’t tasted it as a pasta sauce yet, but have been “taste testing” as I have been getting it completed. (multi-tasking since I have been making more things than just this today so yes, things have been somewhat slow going). It looks delectable and smells wonderful. I did do some modifications though since I did not have everything required – ie the applewood bacon, or the total amount of milk – used PC thick sliced smoked bacon and a mix of coconut milk and milk in the place of those. Also I misread fresh herbs and used dried so cut back on how much of them to use and of course that might change the end flavour some. Hubby prefers a bit of spicy to his pasta sauces so he will be doctoring up a portion of the amount I made. I did get a 5 liter slow cooker full using what was in the recipe in terms of ingredients. I decided to rate it already since I love the idea of the type of sauce combined with pasta (I am going to be using Spaghetti Squash in place of traditional pasta since it has such fewer calories for me) and because the taste testing has been amazing. HAS to be 5 star just based on that flavour! Can’t wait to use y spaghetti squash with it. LOVE the modifications you made to make it yours and work with what you had on hand. The bacon isn’t that big of a deal but the coconut milk substitution would be fabulous! Thank you so much for coming and sharing your feedback Else-Carine! 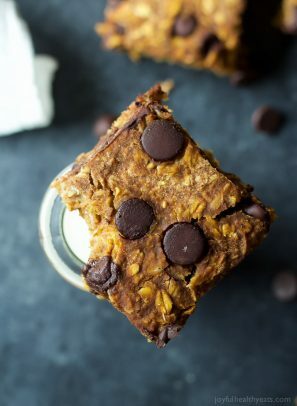 Would this recipe still work ifI subbed a non-dairy milk and butter alternative? Thoughts, anyone? Also, what non-dairy milk would be the creamiest option, if anyone knows — soy, almond, cashew? hey Brooke, you could definitely sub non-dairy milk. I would use coconut milk (from the can, you can find it in the asian food aisle) if I was going to sub it, or almond. Thank you, Krista, for your inspiring post about identity, pride, performance. It is for all of those reasons, in addition to the judgmental factor, that I deleted my facebook account last year. I hated what FB was bringing out in me; I didn’t want to be that person. It’s funny how things can be portals in a way. For i.e… for me, FB turned out to be a portal that brought out many ugly thought patterns, comparing myself..for better or worse, with others. I can accept that they still lurk in me..below the surface..but I choose to remove the portal that encourages them. There is more value in that for me than the positives of FB. I can’t tell you how freeing that decision has been.. I like people again! 🙂 Thank you, also, for your recipe. It’s looks delicious and I will be hopeful to cook it soon. If I flub it up, at least there will be bacon to eat in the least. Thank you – your post really spoke to me today. And the pasta looks awesome! Thank you for an amazing recipe! The flavor is wonderful and practically screams “I am the flavor of Autumn!! !” YUM! And you can’t go wrong with bacon. My family loved it! My boys (3 1/2 years and 1 1/2 years old) devoured their servings. I will be making this again. This was absolutely delicious! I added cinnamon and ginger to make it a bit sweeter and give it more autumn notes. This was the first time handling a butternut squash and wound up with its sap stuck to my hands like glue drying. I tried washing it off but nothing seemed to work until I decided to try a makeup remover pad and it came off easy peasy Incase anyone else has this problem! Yes, the frozen is gonna give off more liquid because it thawing out as you cook it. Use fresh next time or thaw it before cooking it. As far as thickening it up I would maybe add some a tablespoon of cornstarch mix it with water and then add it to the sauce. That should help. I had the same issue with it being very runny, even though I used fresh squash. I ended up putting it back into the skillet after blending to reduce it a bit, which did the trick nicely. This recipe is SO. GOOD. This is so delicious! I used coconut oil and coconut milk instead of the dairy products, and it still turned out smooth and creamy. I had to stop eating tomatoes, and I have been looking for a new pasta sauce since then. I am also gluten and dairy free, which makes things more complicated. This is going in regular rotation effective immediately. Ohh… thank you so much Aubrey! That means the world. I like to write as if I was talking to a friend over coffee, so glad that you felt that. 🙂 And yes, God is so good to reveal stuff like that to us! Hello! Can’t wait to try this. My grocery store is out of fresh thyme. Do you think a smaller amount a dried thyme would drastically affect the taste? Thank you! I know, it’s that time of year where it’s usually sold out. 🙁 No, I don’t think the dried thyme will make a huge difference. But yes I would definitely use less if you’re using dried. 🙂 Hope you like it Katie! Man, I popped on here from Pinterest just looking for a way to cook butternut squash for dinner, but got a helping of truth and encouragement. Wow. God is good. Thanks for being venerable and speaking truth. Ohhh hurray! That makes my heart happy Rachel! Good food for the belly and soul is my goal. 🙂 Thanks for popping in and encouraging me! So good to hear that people actually read it! This looks so creamy and delicious! I don’t eat many pasta dishes but this one is definitely going on the list. Thanks for the recipe! Just bloom and bring your beauty, light and joy to the world. We can never have too much of that. 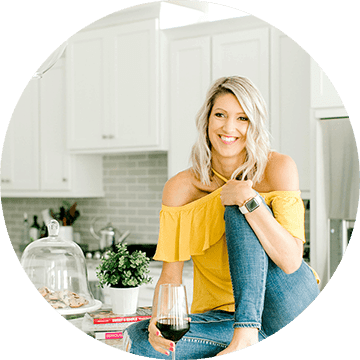 Thank you for sharing your thoughts, words and recipes! Ohhh thank you so much Christine that quote is AWESOME!!! Totally made my day and sooo true! This recipe looks wonderful. I had an abundance of butternut squash so I froze it raw and then thawed it out and it was mushy. I threw that batch out but still kept most of it in the freezer (not willing to give up). So my question is can frozen butternut squash be used in this recipe and in others in place of unfrozen? Thanks for the recipe and hopefully an answer. Hey Helen, you can use it frozen and you can use it frozen for most recipes that call for unfrozen/or raw. I get so bored of regular Alfredo sauce, thanks so much for sharing this twist! I look forward to trying it! you’re welcome janette. you’ll love this! I just want to say how thankful I am for you being honest in this post. It’s a pure blessing and miracle God brought me to look at your page. I stumbled across it via Pinterest, and I am so glad I did. I NEEDED to hear your words, talking about pride, performance, if I don’t measure up I tend to base my worth out of that and then it leads to shame. I’ve been stuck in a place of feeling absolute shame, and not worthy enough, questioning will I ever measure up, will I ever be enough. I needed to be reminded that I AM enough, God says it and that’s final. We do live in a society that bases our worth on our performance, and it’s absolutely horrid. Somehow I’ve fallen into that trap though, I’ve bought the lie and believed that if I don’t perform well today in eating, or exercising, or getting chores done, I’m a failure and not worthy. That’s not truth at all, and your words reminded me of that. I’m so thankful to the Lord for bringing me here to read this. Thank you for being vulnerable and honest, it’s what this world needs. . 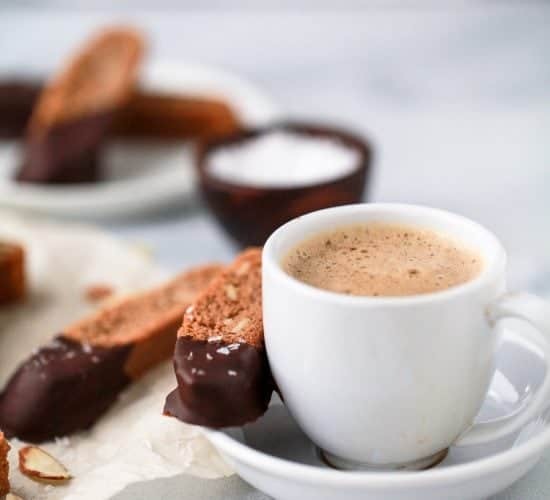 Very nice recipe! Loved it with the bacon. I don’t understand why the recipe says cubes, but picture shows noodles. Please respond. I read all the comments and no one else seemed to ask. 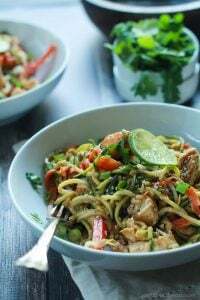 I have a spiralizer and would like to try this delicious looking recipe. Hey Karen, the cubes are meant to be sauteed and then pureed because the butternut squash is turned into a puree. Once the sauce it made it is then tossed in gluten free noodles. If you would like to use zucchini noodles instead then you can definitely do that. It is all explained in the directions. Hope that makes more sense now. About how many cups’ worth of puréed/smashed butternut squash would I need for this? I made son he other day and froze it for soup at some point, but this sounds delicious. Might sub in some kind of “veggie noodles” to make it even healthier! Ohhh thanks girl! You are too sweet! This looks so yummy! I might try this at my next dinner party. Just out of curiosity,!what type of sides do you normally serve with this dish? I’ve never cooked anything with butternut squash before, so I’m not sure what would pair. Thank you! Made this today it was great! we are dairy free and substituted unsweetened coconut milk also added some sweet Italian sausage. This turned out great a wonderful fall meal. The only thing I would wish for was maybe spinach or some veggie added and a pasta substitute. 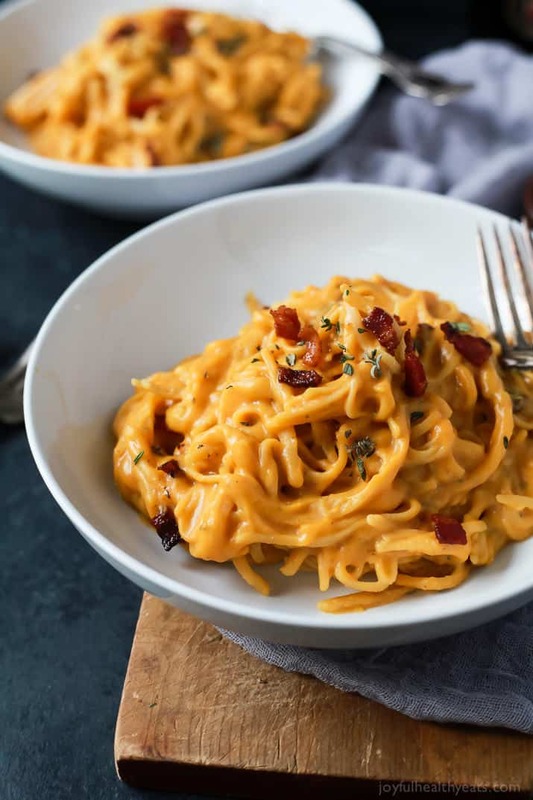 Thank you for this unique creamy pasta dish that was easily made dairy free! 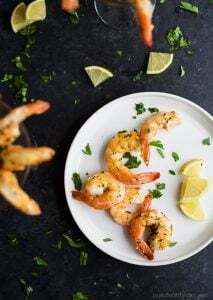 I hope you don’t mind I posted this page on my Facebook cooking page. I wants to share The while post not just the recipe. It’s Barefoot Country Cookin. I just give ideas for supper every night. 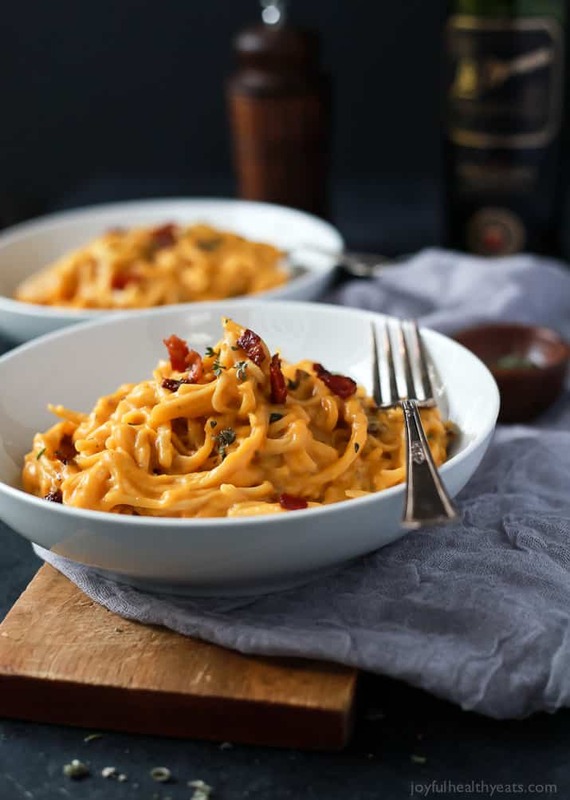 Butternut squash pasta with chorizo | lunchbreak. 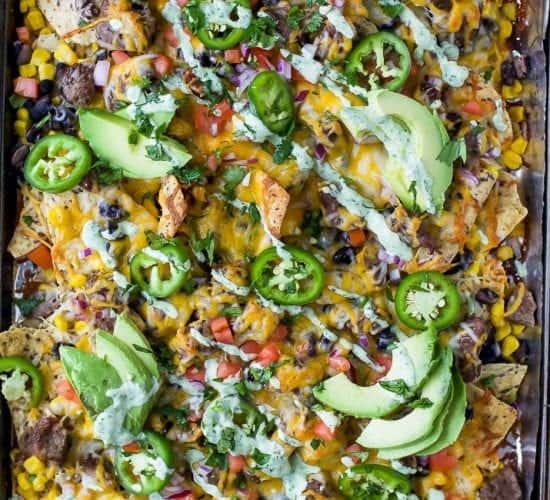 This recipe got rave reviews in my house! Thanks for sharing it!! Definitely a keeper! Very yummy. I need to use less liquid or try adfing the cornstarch as mine came out very runny as well. I used ground turkey instead of bacon and put it over zuccinni noodles. Will definitely be making again. Can’t wait to eat my leftovers later this week. We fell in love with quinoa pasta and I found your your post when looking for more recipes. Loved it! We are also big on butternut squash.